The Salesforce Winter ‘19 release is quickly approaching and soon you’ll be able to take advantage of exciting new features and functionality! 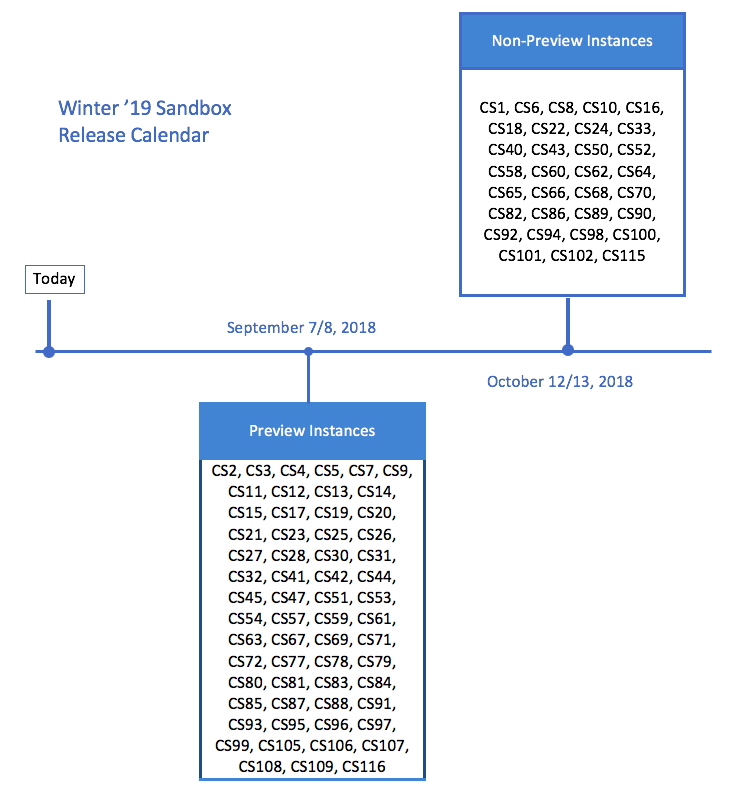 If you are a Sandbox customer, you have the opportunity to get early access to Winter ‘19 in your Sandbox and test new customizations and features before your production organization is upgraded. The Sandbox Preview window for Winter ‘19 is scheduled to begin September 7, 2018. 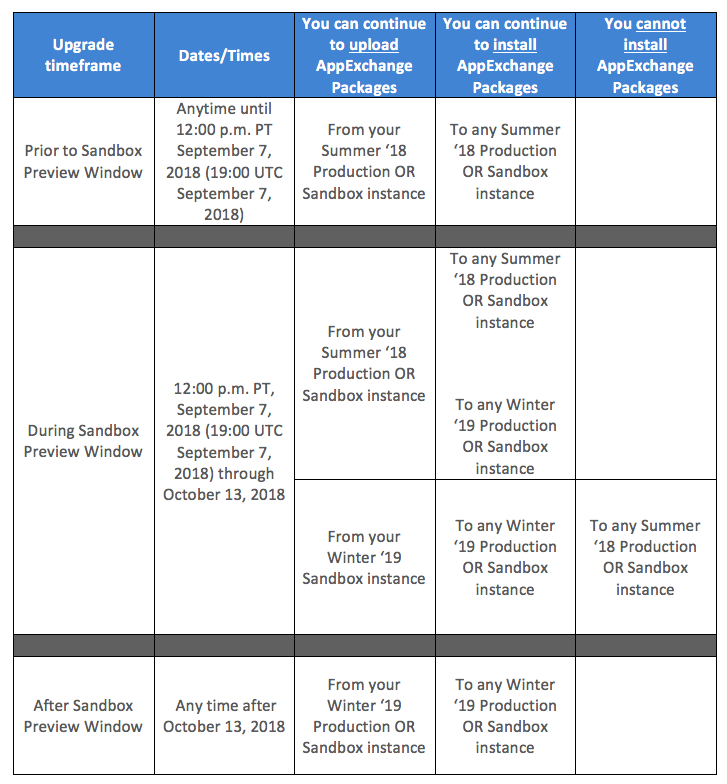 If you would like your Sandbox organization to take part in the Winter ‘19 Preview, your Sandbox must be active on a Preview Instance before September 7, 2018 to take part in an overall instance upgrade. Please read carefully and follow the instructions in the next section for specific information on how to handle each of your Sandboxes. In most cases, you will not need to do anything because your Sandbox is already on a preview instance. But you may need to take action before September 7, 2018 in order for your Sandbox to take part in the Winter ‘19 Preview. Sandbox Instances are split up in two groups – Preview and Non-Preview. Preview Instances are instances which get upgraded to the newer version of Salesforce before Production Instances (e.g. NA2, EU1, AP0) and Non-Preview Instances are upgraded towards the end of a Major Release along with the majority of Production Instances. For the Winter ‘19 Release, the Preview Instances will be upgraded to Winter ‘19 on September 7 and September 8, 2018. Non-Preview Instances will be upgraded to Winter ‘19 on October 12 and October 13, 2018. Between now and September 7, 2018 all sandbox requests will be routed to Preview Instances. 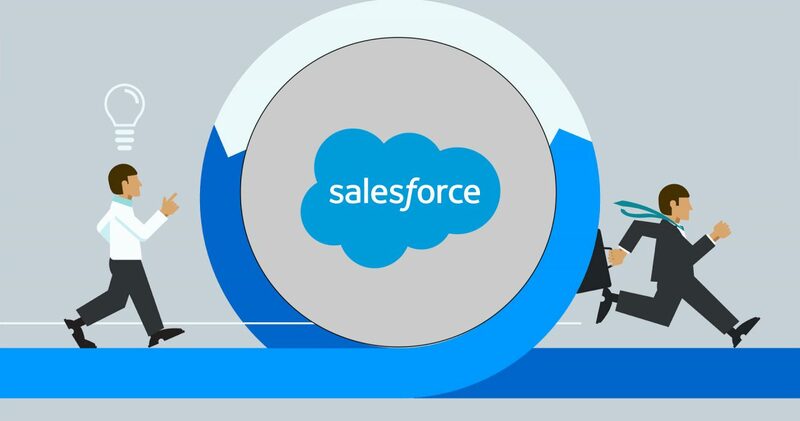 Sandboxes that complete in time for the major release on September 7, 2018 will be upgraded to the newer version of Salesforce. On September 7, 2018, all incomplete sandbox requests will be reset on a Non-Preview Instance. Pending and new sandbox requests will be routed to Non-Preview Instances until your Production Instance is upgraded to Winter ‘19. You have from now until September 7, 2018 to decide if you would like your Sandbox to take part in the Winter ‘19 Preview. Follow the steps below for each Sandbox org that you have. 2) Refresh? Or Don’t Refresh? Or Do Nothing? Note: If you decide to stay on the current Summer ‘18 release, your Sandbox will not be upgraded to Winter ‘19 until October 13, 2018. If you have additional questions about your Sandbox options in conjunction with the Winter ‘19 release, please contact Salesforce Customer Support. Due to the popularity of the Sandbox Preview program, there are often backlogs in Sandbox create and refresh requests. 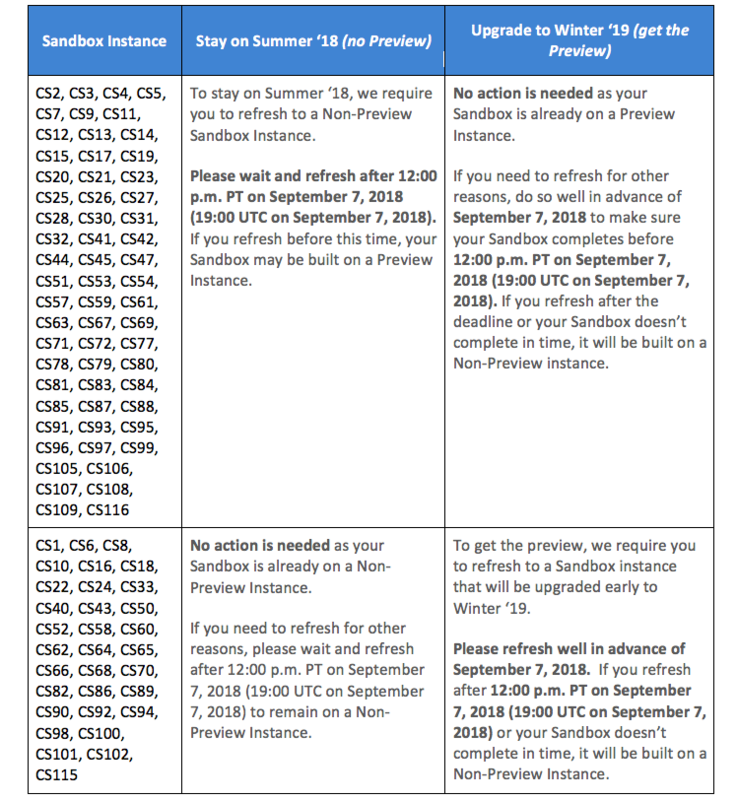 Since all incomplete sandboxes will be reset to a Non-Preview Instance prior to the deadline on September 7, 2018, it is a recommended practice to request your sandbox a week in advance of the deadline to improve your chances of obtaining a completed Sandbox on a Preview Instance. While we strive to process each request in a timely manner, we cannot guarantee completion of the Sandbox before the deadline. You can only clone Sandboxes that are on the same major Salesforce version as the production org. Sandboxes that are upgraded as part of the preview on September 7, 2018 will not be available for cloning until the production org is upgraded to the new release.